Our estate planning clients benefit from Mr. Fromm's extensive experience, knowledge and expertise in the estate planning area. He understands that estate planning requires taking into account the specific family goals and needs of each client, the particular types of assets and how they are titled and owned. He considers estate and inheritance taxes as well as income taxes in developing a hand-tailored estate plan for each client. A specific estate plan is fully explored, discussed, and developed with clients. Mr. Fromm then brings his experience, expertise and attention to detail to implementing the estate plan by crafting client specific and meticulously drafted wills, trusts, durable powers of attorney, advanced medical directive/living wills, and beneficiary designations. Mr. Fromm provides comprehensive tax planning and timely tax preparation for individuals, small businesses, corporations, LLCs, trusts and estates based on their particular tax and financial situation. He provides experienced and knowledgeable tax counsel for clients who have tax problems with the IRS, the Pennsylvania Department of Revenue and the City of Philadelphia Department of Revenue as well as other taxing authorities. He also assists taxpayers with non-filer problems and international tax compliance matters. Finally, he assists clients in determining the proper corporate entity to operate their businesses, and provides legal services and tax strategies for clients selling or acquiring a business. As a Philadelphia estates and probate attorney, Mr. Fromm brings his unique legal, tax and practical experience and training in tax and estate administration matters to facilitate effective, efficient, responsive and timely estate administration for families. He assists executors, administrators, trustees and beneficiaries in the complicated, detailed, and time sensitive tasks of estate and probate procedures, court filings and estate and income tax return preparation for decedents and their estates. As a Pennsylvania estates attorney, he probates estates in Philadelphia, Montgomery, Bucks, Chester, Delaware and other outlying counties in Pennsylvania. We provide a wide variety of income tax planning, tax preparation and related legal services for individuals, corporations, LLCs, partnerships, trusts and estates. We offer tax guidance and representation for clients with IRS, Pennsylvania, and Philadelphia tax problems. We assist clients with foreign taxation considerations including FBAR matters and the Streamlined Foreign Offshore program. We also help taxpayers with non-filer tax problems. For businesses, we also provide tax planning associated with like-kind exchanges, tax free reorganizations, mergers, spin-offs and split-offs. Steven J. Fromm understands that estate planning involves listening to clients' needs and family goals, taking into account their various assets and estate, inheritance and income taxes to determine the proper strategies for each client's estate plan. Mr. Fromm's experience, knowledge and training is at the heart of skillfully drafting legal documents such as wills and trusts, beneficiary designations, and the proper titling of assets. Since 1980, Mr. Fromm has also been involved in not only estate planning matters but with estate and probate administration. We provide legal and tax advice for small businesses in determining the proper legal entity for their operations, while considering the tax, business and financial implications; buying or selling a business, or exit strategies when retiring or selling a business. 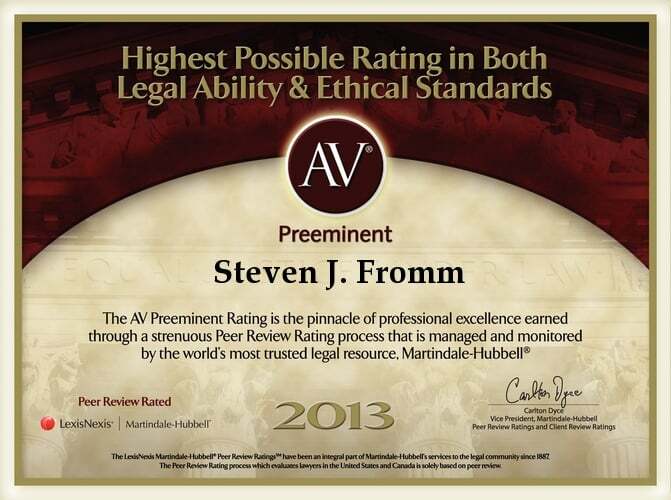 Steven J. Fromm has been a lawyer engaged in the practice of estate, probate, tax and business law in Philadelphia and Pennsylvania for over 38 years. Individuals, estates and trusts, professionals, small business owners, professional corporations, C corporations, S corporations, limited liability corporations (LLCs), sole proprietorship’s and partnerships rely on him for sound and practical legal and tax counsel, to save them money and taxes, and to solve their particular legal, tax, estate or business law problems in an efficient yet comprehensive and well conceived manner. Clients can expect and be assured that he will carefully listen to their particular and specific family, business or tax concerns. Income, estate and gift taxes, business, retirement, or wealth transfer needs and goals are considered and weighed. Mr. Fromm’s legal experience, knowledge and expertise in estate planning, probate, tax and business law is carefully applied to develop appropriate, practical and cost effective legal and tax strategies and solutions for each client’s particular needs and goals. With active client input, legal documents are drafted to meet the particular and specific income tax, business, estate and gift tax, retirement, or wealth transfer objectives. This care, attention to detail, and diligence is at the heart of finding the best strategy or solution to a client’s unique tax or legal problems. Each and every client will get the benefit of his 38 years of practice, experience, training, technical expertise, his diligence and concern for their problems, and his continuous and never-ending study of tax, estate and business law. If this level of service, experience, expertise, dedication and attention to your tax, legal and financial affairs are what you are looking for, please do not hesitate to call Mr. Fromm at 215-735-2336.